The Gospel of the third Sunday is the remarkable conversation between Jesus and the Samaritan woman by the well. The theme is water – which gives life, which cleanses, which is so necessary. This reading forms part of the catechesis given before Baptism at Easter: the candidates who would go into the water are invited to reflect on what that means. But more necessary than the water which gives life is the water which gives eternal life – the water of baptism, the water flowing from Jesus’ side on the cross, his life and Spirit. We have only one candidates preparing for Baptism into the new life of Easter, but with her, we will all renew our baptismal promises: We are invited to reflect on what baptism has given us, what God has done for us in this gift, and what he seeks to renew in us all. Glory to you, O Christ, you are the Word of Life! Prayer of the Faithful: R/. Lord, pour out your spirit. To read Today’s scripture, visit the Catholic Online. 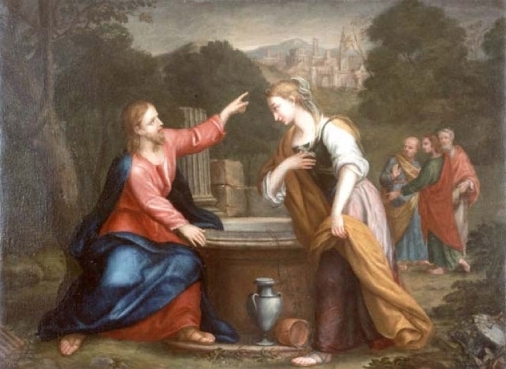 When Jesus met the woman at the well in Sychar (now Nablus), he revealed his message not all at once but gradually, gently, at her speed. Next Next post: Would You Like To Know More About The Faith?